Make Ahead Pepperoni Pizza Sliders are every bit as good as traditional pizza, but you guys…you don’t have to fuss with making crust! 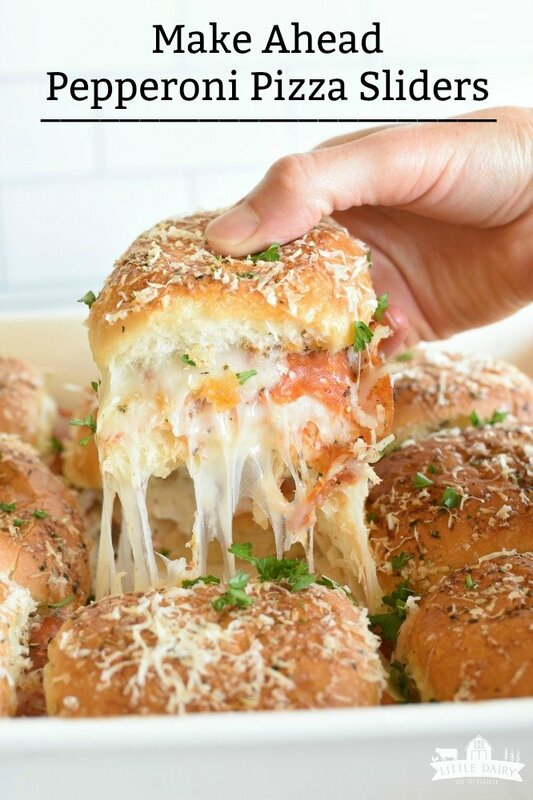 These babies have layers of gooey cheese and pepperoni piled on rolls, then the best part is that crispy parmesan crust on top! Make a big batch so you’ll have plenty of extras to freeze for later! How many Pepperoni Pizza Sliders would you let your child eat in one month? I bet I allow my middle child, Branson, to eat more than you think possible! That’s because he packs them in his school lunches several times a week. And you know what? I’m totally okay with it because they are so much more exciting than a boring old PB&J. When you are a farm boy that was ripped away from everything you love and stuck in a classroom all day, you at least deserve something you love for lunch! Pepperoni Pizza Sliders is what he loves! Besides that they have to be better for him than eating at the cafateria! Make ahead sliders are a game changer too. Keeping a stash of them in the freezer all the time makes packing lunches as quick and easy as grabbing a slider and throwing it in his lunchbox! NOTE: This post was originally posted in 2016. The story and photos were updated in 2018 and a video was added. Sliders are cute little versions of sandwiches. Most of the time they are served warm, cooked either in the oven or on the grill. I love flexibility! 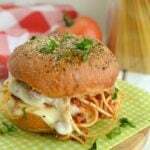 Usually sliders are made from rolls, but really you can use type of bread you’d like. The options are endless; croissants, Hawaiian rolls, mini buns, English muffins, etc. 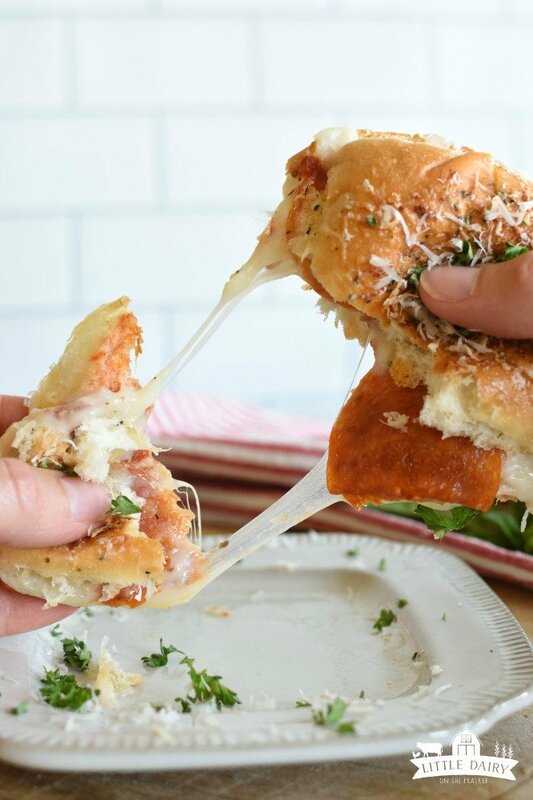 Most of the time sliders involve gooey cheese (check out my Dairy Farmer’s Wife’s Cheese Guide to make that super easy), and some kind of buttery and seasoned concoction brushed on top. As they bake the tops get golden brown and amazing things happen inside! Can I make sliders ahead of time? Yes! You don’t even know how happy it makes me that sliders can be made ahead of time! It’s a life saver! Make ahead meals are what makes my life doable! Here’s what you need to do. Assemble the sliders and stick them in the fridge until you are ready to bake them. When it’s time for lunch or dinner, take them out of the fridge and pop them in the oven until the tops are golden brown and the insides are gooey. If the tops start to get a little too brown cover them with foil while the insides get cooked through. If you’ve sprinkled cheese on top of the sliders be sure to spray the foil with nonstick cooking spray to prevent the foil from sticking to the cheese. Can I freeze sliders? How do I freeze sliders? Assemble sliders, then bake them. Let them cool for a little bit. Then put them in a freezer bag and stick them in the freezer. When you are ready to eat the sliders take them out of the freezer. I typically let them sit in the frige overnight because I send them to school with my kids. Microwave them for about 20-30 seconds depending on your microwave. If want to microwave the sliders straight from the freezer you’ll need to microwave them a little longer. I’ve never tried assembling the sliders, then freezing them before baking them. I assume you can do that although the pizza sauce might make the rolls a little soggy. I would remove them from the freezer and let them sit until they were thawed, then bake as the recipe instructs. Like I said, I’ve never tried that method before though! How many sliders can I make at once? I’ve literally made these sliders a thousand times! Rarely do I only make enough for one meal, although it can easily be done. Heck you could adjust the ingredients just a little and make one single slider. What an easy single serving meal. Most of the time I make enough to feed and army, we’re talking a several cookie sheets of sliders at a time! They’re perfect for feeding to a crowd, or like I said you can always freeze them for later. Never underestimate how many sliders three boys will eat in one setting either! All I’m saying is make lots! What other varieties of sliders can I make? One of my favorite things about sliders is that you can throw pretty much anything on a roll, top it with cheese, bake it up, and call it a slider! Oh, and of course the fact that they can be made ahead is my very favorite get dinner on the table hack! Check out these other sliders that we absolutley love! 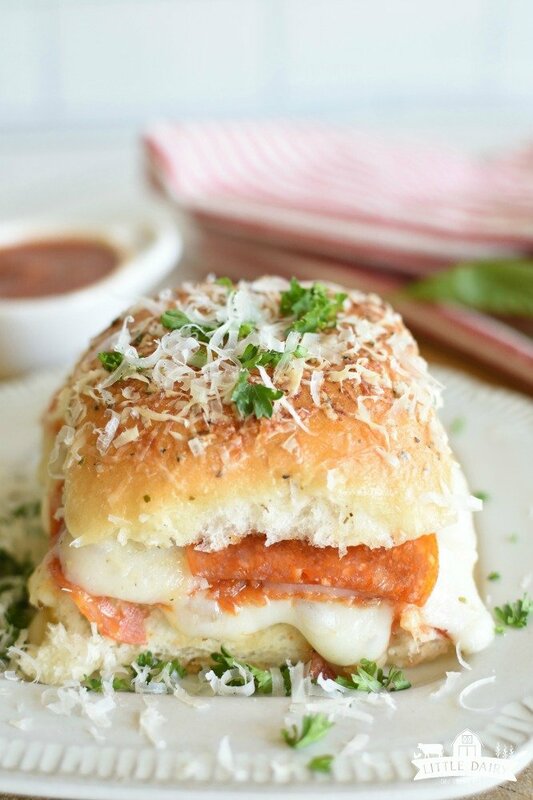 Grab the Pepperoni Pizza Sliders recipe! When you live too far away for pizza delivery Pepperoni Pizza Sliders are pretty darn good! 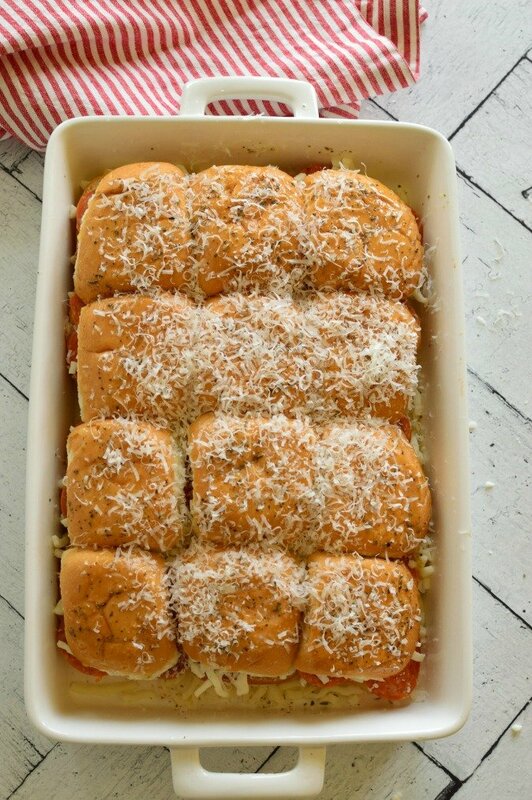 Make Ahead Pepperoni Pizza Sliders are a super easy and fun way to serve pizza. I’m not sure which I fell in love with first, the extra cheesy fillings, or the crispy Italian topping on the bread! Either way these are a winner with kids and adults! Cut rolls in half. Set bottom halves in a greased baking pan. Spread pizza, or marinara sauce on the rolls in the pan. 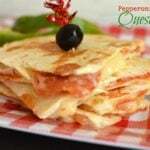 Sprinkle a layer of grated cheese or a slice of cheese over marinara. 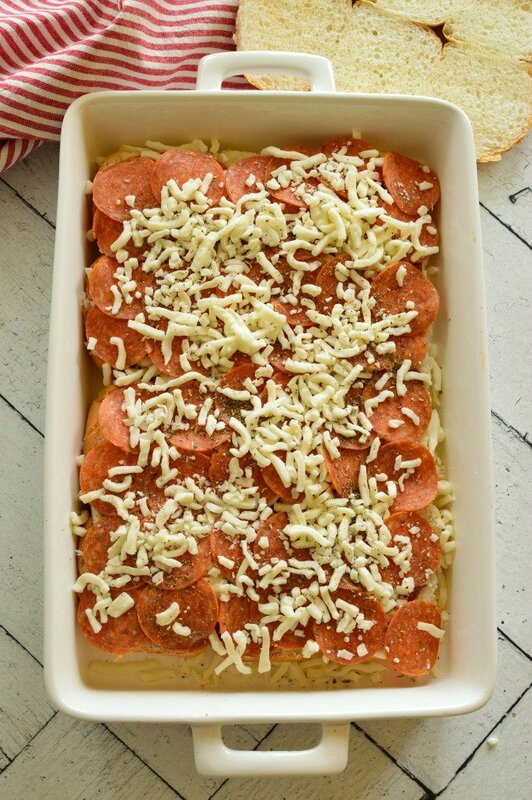 Layer pepperoni slices over cheese. Add another layer of cheese. Add the top parts of the rolls. Melt butter. Add garlic, Italian seasoning, Parmesan cheese, and a little salt. Stir to combine. Brush over the tops of the sliders. You can either refrigerate at this point or bake. If you are baking immediately, bake for about 10 minutes. You want the insides to be nice and gooey and the tops to be golden brown. If the rolls get too brown before the insides are baked, cover with aluminum foil and continue baking until insides are melted. If you are baking later, cover sliders with aluminum foil and bake for 10 minutes. Remove foil and continue baking for about 10 more minutes. If cheese still isn’t melted and the tops are golden brown, recover with aluminum foil and bake a little longer. Amy, these look delicious! We both share a love from easy, tasty food! Quick Question – you mentioned you used baked frozen rolls. Is there a particular roll you prefer – Rhodes Rolls? Do you pre-bake them and just leave them in the freezer when you want a slider? If so, do you pull them straight of the freezer and assemble them with the toppings and pop in the oven without thawing the rolls? I’m all about easy so I thought I’d find out what’s worked well for you in the rolls regard. Of course it’s all about easy recipes! Who has time for anything else? I buy Rhodes Rolls and leave them frozen until I’m ready to use them. I bake them according to the instructions on the package, let them cool, then proceed with the rest of the recipe. Sometimes I freeze the pizza sliders after they are baked and then pull them out of the freezer on super busy nights, or to stick in the boys lunchboxes. Thanks for your reply and tips, Amy! I hope you’re doing well. Have you ever frozen these? I am looking for meals to make ahead and freeze for vacation. Do you think that would work for this recipe! I’m glad you asked. I make huge batches of these and freeze them. My kids love taking them to school in their lunches. It works perfect because their teachers have microwaves for the kids to use! It’s nice to know I have dinner all ready in the freezer if I need it too! What is your process if you freeze them? I’m assuming you freeze before baking, correct? Then, can they be baked immediately out of the freezer or do they need to be thawed first? How long? Looking to make a big batch to freeze ahead. Hi Meggan! I usually bake them before I freeze them so my boys can pack them in their lunches for school or microwave them one at a time later on. You can freeze them before baking but I like to be able to grab one at a time so I bake them first! Either way, they are a lifesaver on busy days! 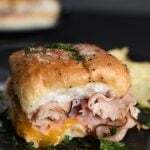 What type of frozen rolls do you use for your sliders? I always use Rhodes Rolls if I’m using frozen rolls. Of course you could skip the baking the rolls step and just buy rolls that are already baked if you wanted to. Since I live so far from the grocery store I end up using Rhodes because I always have them on hand! Thank you so much for these great ideas!! I need a kid friendly, make ahead vegetarian sandwich to serve at a birthday party. Could I do this with just cheese and sauce…maybe mushrooms or spinach? Oh man…I’m not very good at vegetarian because we love meat! I do love veggies though and I’m thinking a mushroom and cheese slider would be yummy! If kids liked sauteed onions you could add those too! I have a bunch of Hawaiian Rolls I was planning on using for something else. I’m having a 40th birthday party for my husband. These sound delicious, however, if I make them. Are they good sitting out for awhile or is it something that should be eaten right away? Hate to make them and they get all soggy etc. Hi Melissa! Happy Birthday to your husband! I make these in advance all the time. When I make them for parties I assemble them in advance and put them in the fridge until it’s time to party. When you are ready for your party all that’s left is sticking them in the oven and baking them. They will come out perfect! Good luck! Hi Carrie! My boys pack these in their school lunches several times a week! Of course I’m not there to see how long they are microwaving them. I would suggest 30 seconds at full power, rotate it and microwave for another 30 seconds. Every microwave seems to heat a little differently so you might have to adjust times for you microwave! It’s a lifesaver to have them in the freezer for crazy days! What type of frozen rolls do you use?! Actually I saw that you already replied to this question! Sorry! Do you prefer pizza sauce or marinara and what brand?! Hi Kelsey! I can my own pizza sauce in the summer and that’s what I always use! It’s a little thinner than store bought pizza sauces so I think if I was going to use store bought I’d stick with marinara! 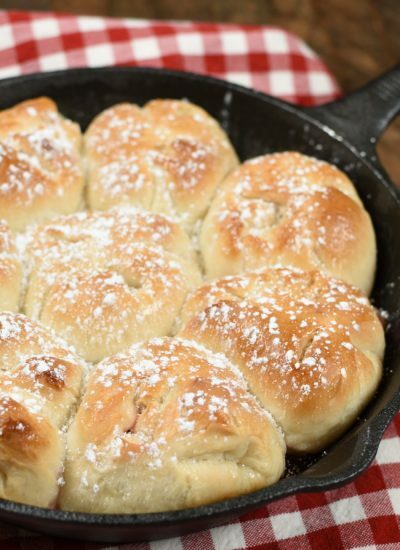 Is it Rhodes yeast rolls you use? Yes. I almost always use Rhodes rolls because I always have them stocked in my freezer and they are yummy! These are a hit with my grandkids. I’ve made them 3 times in the last week and I can’t see it letting up soon. Thank-you so much for this wonderfully good recipe! Kids always go crazy for Pepperoni Pizza Sliders and I love them because they are so easy to make! Enjoy those grandkids! Such an awesome idea! Made these for the kids, and they loved them! I made with pepperoni slices, and half the pan, I added fresh spinach to as well. What a hit! The only drawback for us was that the bottom was more soggy than we expected. Maybe next time, we will toast the pan of bottom buns first before assembling. Kudos! Mmmm! Adding spinach is a such a great idea! I bet the kids gobble it right up! Toasting the bottom buns first will probably help with the soggy issue a bit. I guess we haven’t really noticed it being a problem before! Glad you enjoyed them! 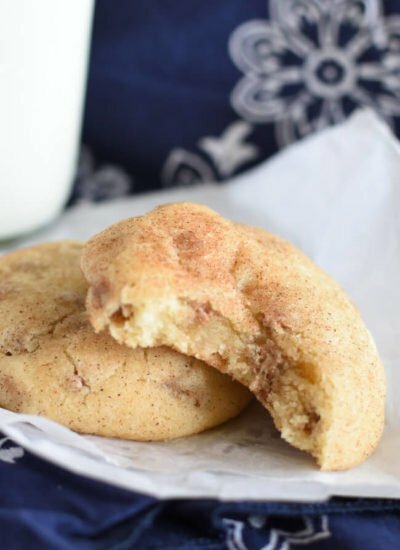 I made these…I used too much salt, but otherwise…they were pretty good! Yay! Glad you liked them! Pepperoni and cheese are both salty so it’s just takes a little bit for the tops! My kids love to take these to school in their lunches! I’m thinking of making these for my wedding brunch! I’ll definitely be making them ahead of time and freezing them, but I wanted to check with you on what you suggest for reheating. I’m thinking no thawing necessary (it might make the buns get soggy), 375 for like 15 minutes? I would probably bake them before freezing but want to make sure that the insides aren’t cold when serving them! What do you think? Hi Kristin! Congratulations on your engagement! 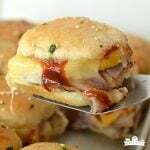 I freeze these sliders to put in my boys school lunches and they LOVE them! I do bake the sliders before freezing them, then put them in a sealable freezer bag. When I’m packing my boys lunches in the morning I remove the sliders from the freezer and put them in a container to send to school. My kids microwave them at lunch time for about 30 seconds. They never complain about the sliders being soggy. I’ve made them in advance and served them at functions many times. I prepare the sliders, then keep them in the fridge until about 20 minutes before serving time. Then I pop them in the oven and bake the sliders until the cheese is melted and they are browned on top. They are always a hit! Good luck! Let me know if I can help in any other way! I’m sure these are a huge hit on game day! So perfect for a party! Game day is all about the food isn’t it! These are a perfect addition! OH MY these look amazing and are the perfect game day or party appetizer! Anything that can be made ahead of time makes parties easier! Especially when they are this tasty! WOW! These sliders look SO delicious!! Perfect for game day! Game day is one of my favorite days! Love these! I bet those flavors are amazing! Cannot wait to try this! Love! Thanks Chrissie! These sliders are so much fun for the kids! Enjoy! We love cheesy sliders! 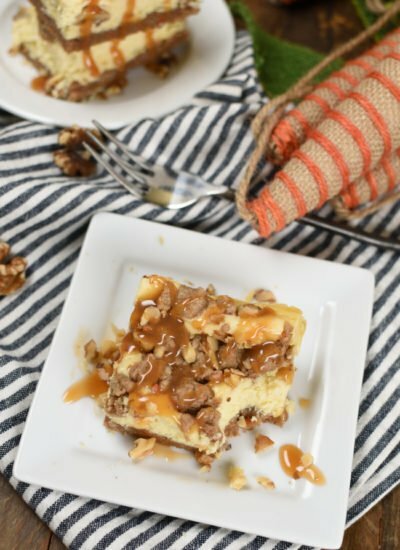 Awesome for lunch or as an appetizer for a game day! Anything cheesy is a win! These are perfect for game day! A happy plate! I love that! Happy plates means happy moms right! I made these tonight for our youth group at church. They were a hit! So easy and good! I used grocery store brand slider buns, already cut so saved time and they worked out great. Thanks for a great recipe! Kids go crazy for these every time! 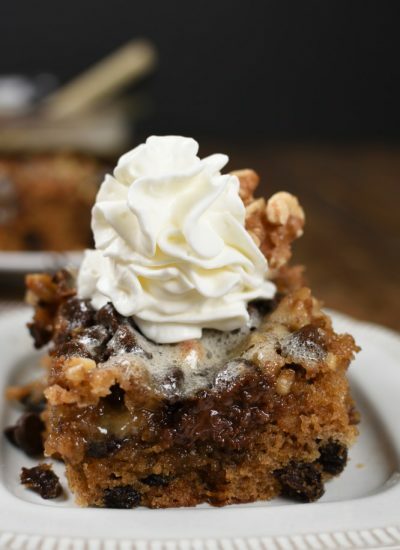 They’re one of my favorite go to recipes because they’re so darn easy! Glad you enjoyed them! These little guys are insanely good and crazy easy too. I put them together about 4 hours before I was going to be ready to bake them and they did not get soggy. So in case anyone is wondering about that, it is not a problem! I served them at our annual New Years Eve party and the kids and adults alike loved them! They were the first thing to be totally gone off the buffet table. Definitely going to have to make these again. They are so easy to put together, and since I was making two pans of these, I let my 11 year old daughter do one pan and I did the other. They are perfect for a party, or even to serve for dinner and get your kids in the kitchen to help. Love it! Thanks for the feedback! It’s always fun to hear how much people enjoy a recipe! We love these sliders for so many reasons! I’m so happy you found the recipe!